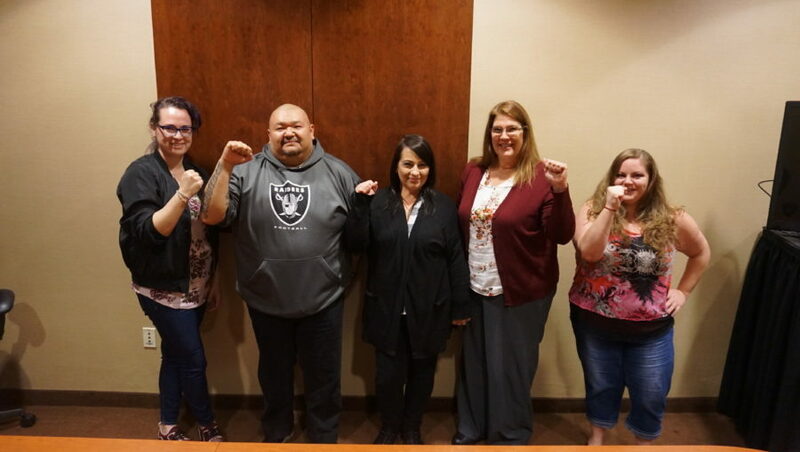 The small but vital clerical unit at Recology South Valley and representatives of Teamsters Local 350 met on July 19, 2018, to discuss what they would like to see on their next contract. After nearly 7 months of hard-nosed negotiating, led by Recording Secretary and Business Representative Sergio Arrañaga and with the assistance of Adriana Munoz-Noriega, they were able to successfully hammer out a 5-year contract. “The negotiations took longer than expected. However, with agreed upon language, we were able to improve working conditions and were able to get significant economic increases that will give them job security for the next 5 years. The key is that we were able to have all these improvements with no takeaways and we continue to build and strengthen these agreements for years to come” says Recording-Secretary Sergio Arrañaga. The unanimous yes vote does not surprise Sister Munoz-Noriega. “I’d like to thank Teamsters Local 350 for all they have done. By taking all the issues and needs of my coworkers, and having them in mind and by helping me understand the tactics to achieve our goals." This process is proof that no matter how big or small of a unit, a unit that fights together, wins together.